I've talked before about our innate predilection to like cute friendly robots... 'bots like Keepon, and R2-D2, and WALL-E(*). Science observer Kevin Kelly has been thinking along the same lines, inspired by recently seeing some extraordinarily graceful robotic jellyfish. I think we are primed to find lifelikeness in machines. E.O. Wilson calls it our biophilia -- our intense attraction to living things. As we design machines to approach the complexity of organisms and mimic their behavior (as these do), we will be very quick to include them in our love. Isn't it strange we rush to love these bots, but not to the same degree, say, automobile fuel pumps? The pumps are no less complex or capable. These mechanical jellies tell me that when we make artificial intelligences even 1/2 as smart as a dog, we will love it to pieces. Read Kevin Kelly's thoughts here. 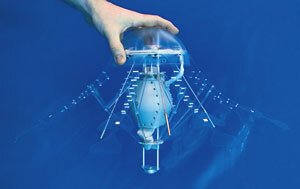 Check out a video of the robotic jellyfish on Design News. (*)Disclosure: I work for Disney, which owns Pixar, which made WALL-E.